With over 270 Early Warning Sirens throughout Oakland County, residents are provided a tool to stay informed of approaching severe weather when they are outdoors and may be away from television or radio media sources. Oakland County's policy is to activate the warning sirens when a Tornado Warning or a Severe Thunderstorm with forecast winds of 70 MPH or more has been issued by the National Weather Service. When activated, the sirens will sound for a period of approximately three minutes. Residents are advised to listen to a radio or watch television in order to hear detailed information concerning the weather threat. Oakland County policy is to activate all sirens in the county for any event that requires activation. With the size of the county, this will sometimes lead to the sirens sounding in an area where the sun is out, but another part of the county is under a weather threat. The Oakland County sirens are tested on the first Saturday of every month from March through November. No tests are conducted in December, January, or February. The April test is conducted at 1:00 PM on the Wednesday during Severe Weather Awareness Week. Note that if there is any threat of severe weather, or weather that may appear to be severe, the test for that month may be cancelled by the Homeland Security Division. 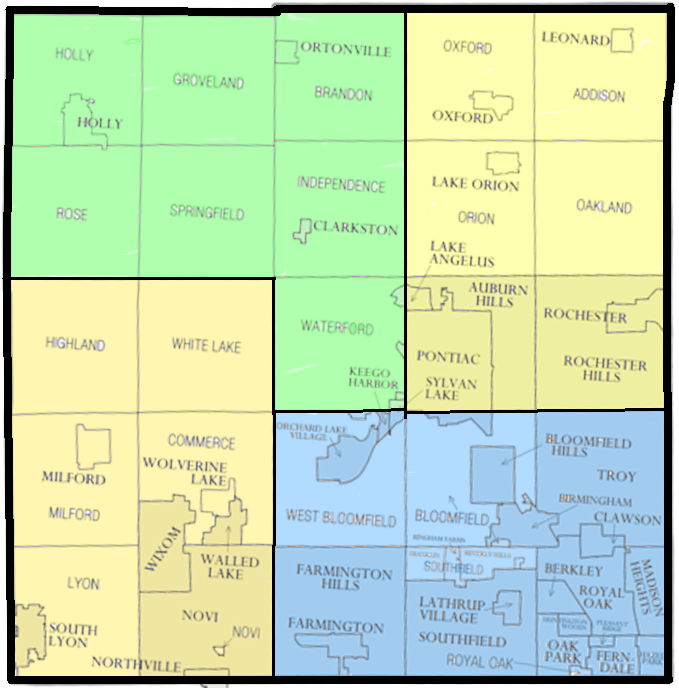 The Oakland County ARPSC uses a Primary and Subnet system for the monthly siren test net. The subnets are responsible for all sirens within their geographical area of the county. A listing of all subnets, including contact information and a geographical map of the areas covered by each may be found below. Assigning sirens in advance prevents duplication of effort. We don't want two operators checking the same siren in the same month. Ensures that sirens designated as "Hot Sirens" by Oakland County Homeland Security Division are covered. Hot sirens are usually sirens that have had repairs made or indicated an anomaly during a previous test. Allows the subnet coordinator to assign a siren that has not been checked in the current year. If a siren test is cancelled due to weather concerns, the primary net control operator at the EOC will notify all subnet operators of the cancellation. This may occur over the air, or by phone as needed. All amateur radio operators are encouraged to participate in the monthly siren test. Subnet control operators usually start their net approximately 30 minutes before the sirens are sounded. Subnet operators typically start with a roll call of all stations that have been assigned a siren in advance, followed by a request for any other stations that would like to check a siren. Contact the Subnet coordinator in your area to request a siren. Please provide the areas you are willing to travel to in your message. The subnet coordinator will then assign a siren within that area for you to check. Make sure your radio is programmed for the appropriate subnet repeater frequency. Plan to arrive at your assigned siren at least 20 minutes early to allow sufficient time to locate the siren and get into position. When called, let the subnet control operator know your status (i.e., enroute to your assigned siren or on station at your assigned station). This confirms to the subnet control operator that you will be prepared to check your assigned siren. Observe the items noted in the What to Check section below during the test. Report your results when the subnet control operator calls on you for your report. Report "All OK" if the siren looks and performs properly, or report specific concerns or conditions requiring attention. Encroachment of tree limbs, vegetation, or the presence of any bird or insect nests on the control box, siren horn, or power lines feeding the siren. Sirens are chosen by the subnet coordinator based on the list of "Hot Sirens" provided by the Homeland Security Division and from sirens that have not been checked during the current calendar year. Sirens are assigned on a first-come basis. Membership in the Oakland County ARPSC is not required to participate in the monthly siren test nets. Contact the subnet coordinator for an assignment. Subnet coordinators are expected to keep track of the siren assignments made prior to a scheduled test in order to avoid duplicate assignments. Once a siren is assigned or chosen, you are expected to observe that siren. If for some reason you cannot meet your obligation, you must notify the subnet coordinator as soon as possible to allow time to find a replacement. Volunteers are expected to go anywhere in the home quadrant, not just near your home. Volunteers should be willing to fan out during the season to cover other remaining sirens in the home quadrant, and then remaining sirens in other quadrants if needed to help meet our goal of checking all sirens. Siren maps are considered secure by the OCDHS and cannot be shared publicly. Locations/directions will be provided by the subnet coordinator as needed. Once all of the sirens in a geographic area have been tested and observed, any siren in that area can be re-checked. This must still be coordinated with the subnet coordinator in order to avoid duplicate assignments. Testing the same siren multiple times serves a limited purpose unless the siren is designated as a "Hot siren" and requires retesting.